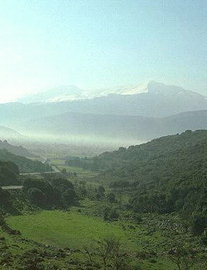 The plateau is 850 metres above sea level. It is 12km from east to west and 6km north to south and surrounded by high peaks, the highest is Spathi at 2,418 metres above sea level. These peaks protected the inhabitants of the plateau from attack. 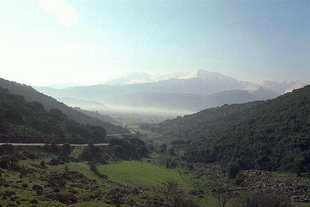 There are two entrances to the plateau: one is from the side of Agios Nikolaos and the other is a pass into the plateau coming from the Heraklion side through Kera. 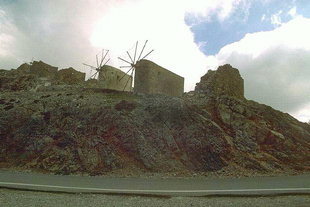 The Seli Ambelos Pass, at 900 metres, is dotted with abandoned windmills on either side. There is an impressive view of the plateau from here.